I didn't use a fifty to show off; I did it to freak John out. ("What are you doing with my fifty?!") Hee! You can stick any coin in the middle, so I grabbed this one from my stash of antique coins just to be different. That's a clear glass pebble (like the ones you fill flower bowls with) with a printed message glued to the back. The bubble of the glass magnifies the message a little - kind of a neat affect. Go here for the heart fold tutorial. 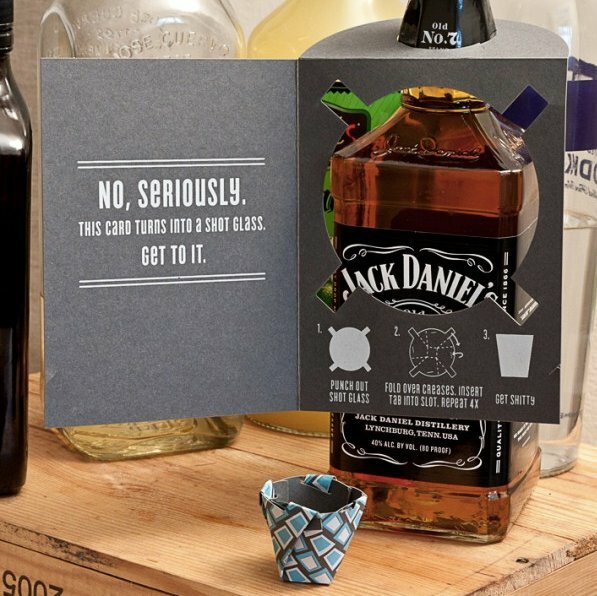 Not exactly a DIY, but have you guys seen this fun origami shot glass birthday card? You can order one here for $4.99. I love origami. I learned two things years ago that I still do today. I learned them from "Zoom" on PBS. One is a story that goes with a paper boat. And the other is how to make a paper cup using a sheet of paper. The paper boat story facinates kids and a couple of times when we were out and about and needed a drink but the water barely left the fountain I just whipped up a cup and we were all set. My daughter thought I was the greatest. 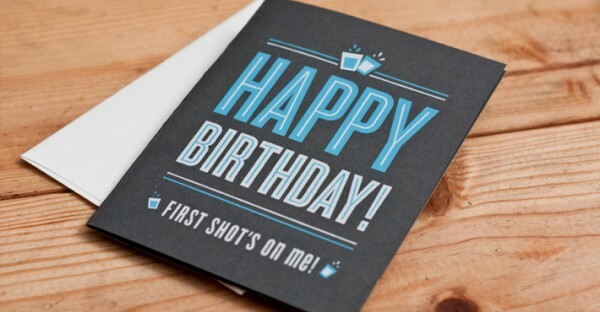 The shot glass card is really neat, I only wish it didn't end with "Get sh***y." It's on Netflix streaming for instant gratification. Gosh Darn it...I could of used that money folding idea when it was omgosh everyone is graduating graduation time and I don't have any gift ideas. Oh well, next May. Worlds collide! The designer of the shot glass card is a fellow alumnus, and I knew that thing was going to be a hit the minute I saw him post it. Seeing it featured on my favorite geeky crafty blog is awesome! Ross has got lots of other graphic artwork that he designs and prints himself over at his shop, Fifty Five Hi's. I own a bunch myself - really worth a look! OH, I was going to try the bow, but when I saw the directions I thought "Oh, this is why I am not crafty!" I got lost at step 3. Thanks for the neat ideas, though. First of all, nice work! My folding skills are awful, and I'm that much more appreciative when someone does origami really well. "the really cool thing is that the cup portion comes pre-creased, which allows you to assemble it in just a couple of seconds." Which is necessary because if you're like me, you've already had a few drinks before getting to presents. So trying to fold a non-pre-creased shot glass would be extremely entertaining for other party guests but not so entertaining for the birthday girl. Alright, Maureen, how do you make a cup out of a sheet of paper? 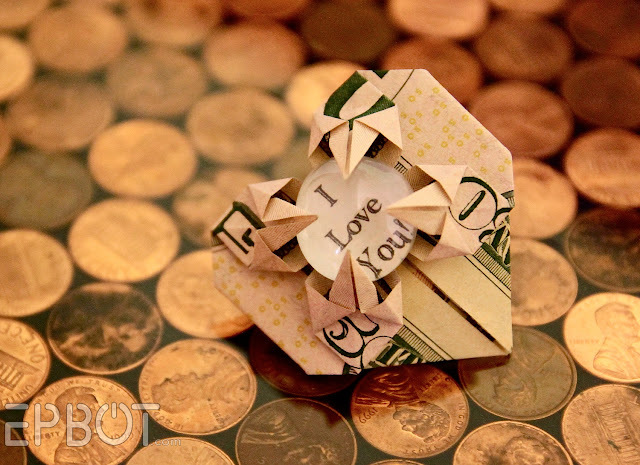 I also really love origami--I took an origami class one summer when I was a kid and loved it. I also helped fold 1000 red cranes for a Japanese friend's dad's 60th birthday. It's a traditional decoration at a Japanese person's 60th birthday party. The red crane represents new life, so you are starting a new life at 60. Usually they're strung together and hung from the ceiling, but instead we put them in a giant glass jar. Her dad loved it so much that he put it on the hearth of his fireplace and would just sit and look at it. It was so fun to fold all those cranes, but I had red ink on my fingertips for WEEKS. It was worth it, though. 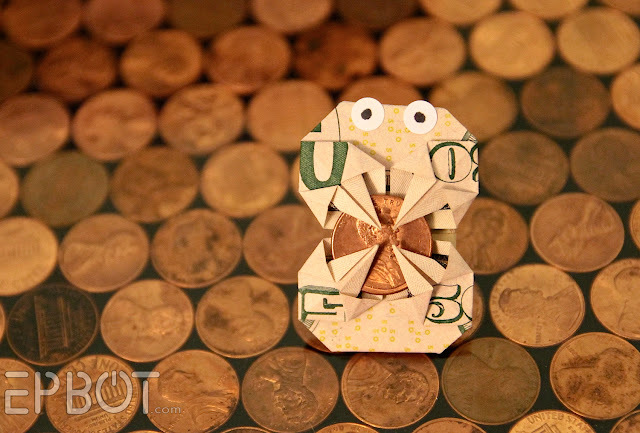 I love the dollar origami. I think it is a great idea for a grad gift! and the pebble message can personalize it. I love those paper bows! I've made a lemon/lime one from a magazine and I'll be making more! 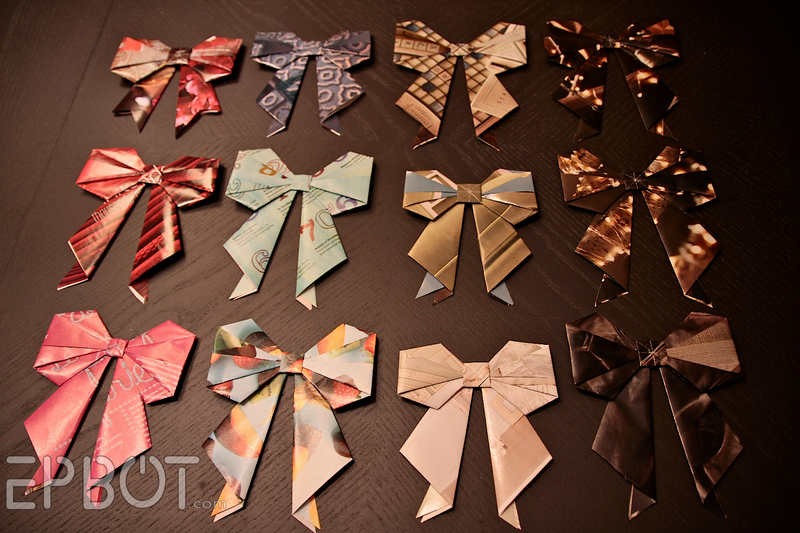 I never would have thought of doing origami with magazine pages, but it's a perfect idea. Thanks for the protip! @ Maureen - the paper cup is the *only* thing I can fold without instructions. Ha! I learned it as a kid some time. @ Colleen - Yes, I've seen it! Great documentary. @ Marisa Elana - Ah, I should have realized! I visited Israel when I was a teen, and loved it. I'll look you up if I ever get to go again! LOL. 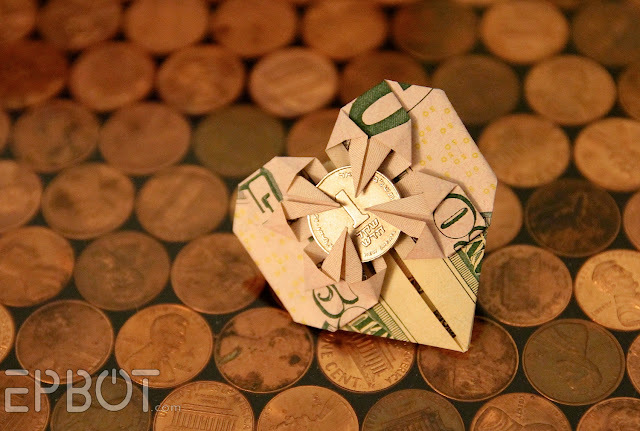 I thought the heart money fold was one of your geeky space movie battleships! Am searching for the cup fold instructions next! 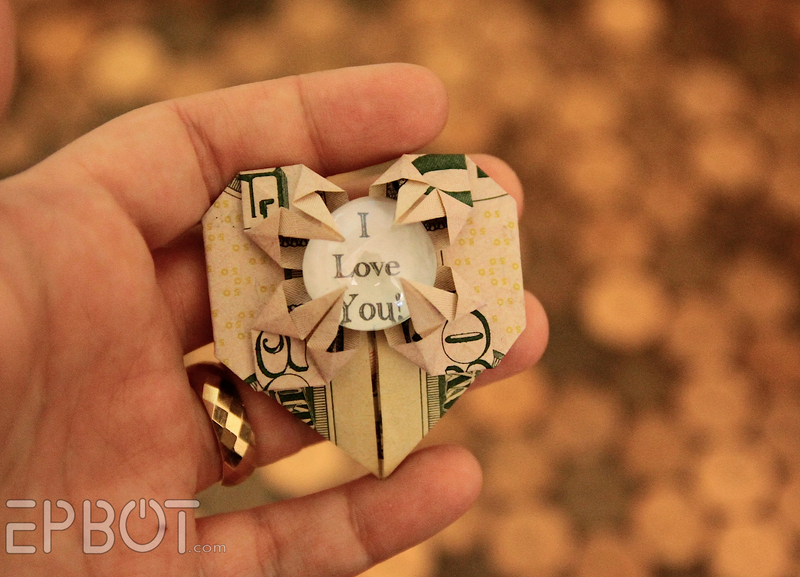 Oh my gosh, is that actually an antique Israeli shekel that your 50-dollar heart is holding? Sigh, just make me love your blog even more, why don't you? :) Very cool stuff. Hey, I made these origami hearts as Save-the-Dates for my wedding! Not with dollar bills, though.